These puppies spread out quite a bit when they bake. I like them best when they are soft and chewey but lots of people say they should be hard and crunchy. Either way they're GREAT and they last a long time. ... well they would last a long time if my sons and I could be trusted to keep our sticky fingers out of the tin! If you can't find light treacle, then honey might work, or maple syrup. Golden Syrup is just sugar. It's not refined into tiny crystals, but comes as a thick, gluggy, sticky syrup. As the name implies it's golden, not black like dark molasses. I think there's a product called Light Molasses in the USA you can use, which is a direct substitute. In the USA, some listeners have said you can use Karo corn syrup, although since that's a corn product and not a sugar by-product I think the biscuits might turn out differently. In the UK, there's a product called Tate & Lyle's Golden Syrup which is the same thing, I think. Or you can make your own. Here's a recipe for making your own golden syrup, but I havent made it myself so I have to take the author's word for it. Put 1/4 cup sugar in a small heavy saucepan and shake pan so the sugar is in an even layer. Sprinkle it with 1/2 tsp vinegar and 1 tsp water. Cook over low heat, without stirring, for 5 minutes. Increase heat to medium and cook until syrup has taken on a light caramel color, 5 to 6 minutes. Immediately remove from heat and pour int 1/3 cup light corn syrup. Do not stir, but let it bubble for 2 to 3 minutes. When the bubbling stops, stir well. It can be stored at room temperature for several months. I made it to the gourmet shop out here and bought a tin of Lyle's Golden Syrup, in order to tell what it tasted like, and whether Karo corn syrup would be a good substitute. Well, the consistency is about the same, with Golden syrup slightly thinner. The flavor of the Golden syrup, however, was a little more pronounced than light corn syrup. Light corn syrup could be used as a substitute, but it would be a little closer to use 1 teaspoon of either dark corn syrup or unsulphured molasses and 2 teaspoons of light corn syrup. I, of course, now have about a year's worth of sweetening and won't be worrying about substitutions. The acronym ANZAC was coined in 1915 when Australian and New Zealand troops were training in Egypt. A bureaucrat got sick of typing 'Australian and New Zealand Army Corps' so started using the acronym 'ANZAC'. The word ANZAC was eventually applied to all Australian and New Zealand soldiers in World War 1. The term is particularly associated with the landing at Gallipoli on 25 April 1915. ANZAC Day was inaugurated on 25 April 1916 to commemorate the first anniversary of the landing of the ANZAC troops at Gallipoli. During World War 1 and World War 2, Australians were fiercely patriotic. This can best be described in the words, 'my country - right or wrong'. The wives, mothers and girlfriends were concerned for the nutritional value of the food being supplied to their men. Here was a problem. Any food they sent to the fighting men had to be carried in the ships of the Merchant Navy. Most of these were lucky to maintain a speed of ten knots (18.5 kilometres per hour). Most had no refrigerated facilities, so any food sent had to be able to remain edible after periods in excess of two months. A body of women came up with the answer - a biscuit with all the nutritional values possible. The basis was a Scottish recipe using rolled oats which were used extensively in Scotland, especially for a heavy porridge that helped counteract the extremely cold climate. The ingredients they used were rolled oats, sugar, plain flour, coconut, butter, golden syrup or treacle, bi-carbonate of soda and boiling water. All these items did not readily spoil. At first the biscuits were called Soldiers' Biscuits, but after the landing on Gallipoli, they were renamed ANZAC Biscuits. A point of interest is the lack of eggs to bind the ANZAC biscuit mixture together. Because of the war, many of the poultry farmers had joined the services, thus eggs were scarce. The binding agent for the biscuits was golden syrup or treacle. Eggs that were sent long distances were coated with a product called ke peg (like Vaseline) then packed in air tight containers filled with sand to cushion the eggs and keep out the air. 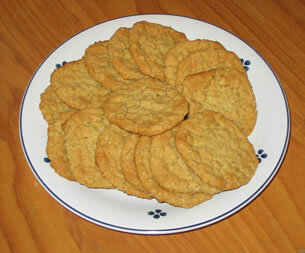 As the war drew on, many groups like the CWA (Country Women's Association), church committees, schools and other women's organisations devoted a great deal of time to the making of ANZAC biscuits. To ensure that the biscuits remained crisp, they were packed in used tins such as Billy Tea tins. You can see some of these tins appearing in your supermarket as exact replicas of the ones of earlier years. Look around. The tins were airtight, thus no moisture in the atmosphere was able to soak into the biscuits and make them soft. During World War 2, with refrigeration in so many merchant navy ships, the biscuits were not made to any great extent as it was now possible to send a greater variety of food such as fruit cake.